Something I Made: A mini present guide for 1-4 year olds! I've never wrapped as many presents as I have since I've become a Mother of a four year old. It's just party, party, party. 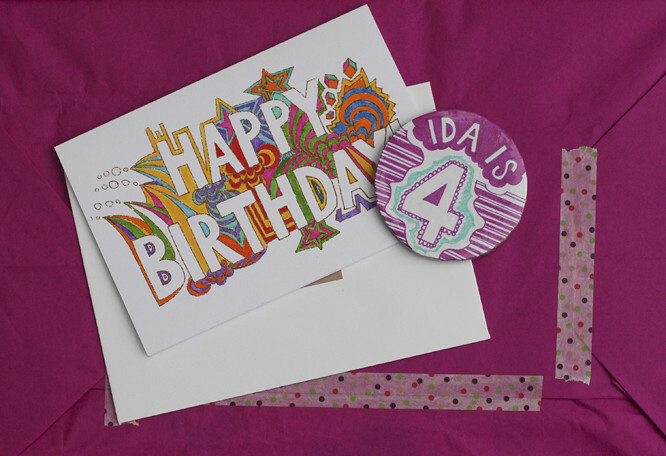 This week for Ida's party I decided to make her her own '4' badge... I'm quite pleased with this and I think they'll be many more variations on custom badges in the coming months - plus I got to use sticky-backed plastic for the first time in AGES. We more often than not stick to books for presents but here are my top non-book presents for kids for around a tenner! 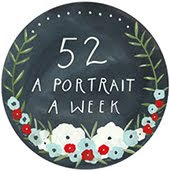 Might do a post of our favourite books soon... but it would be very very long. 1 yr old - We love the O-Ball - great for under ones too. Little fingers can hold on to it and it's easy to throw and catch. 2 year old - Melissa and Doug magnetic hide and seek board, lots of doors to open and things to discover (a bit over a tenner - but worth it). 3 year old - Spotty dogs is a great learning-to-count game, Hugh's sister got it for Coco on her third birthday and we've played it quite a lot (under-statement...) Now Coco is four it's fun watching her try to cheat! 4 year old - I think that most four year olds I know love a bit of dressing up, so recently for one of Coco's friends birthday I just bought a selection of (frankly quite cheap) hats from our local toyshop. We have some funny bowler hats in Coco's dressing up box which can add a clock-work orange slant to our play-dates!